…that comic being New Gods #13 (1977), where Gerry Conway, Don Newton and Dan Adkins tried to continue from where Jack Kirby left off. As was pointed out by other Twittering folks, those are quite the choices for representative disco performers. KC and the Sunshine Band, sure; Rick Dees and “Disco Duck,” well…I mean, why not, that’s as much of the era as anything else. I’ve never really had much exposure to these post-Kirby New Gods comics…it’s a weird alternate universe divergence from Kirby’s particular and peculiar vision, but still it’s hard to complain about some nice Don Newton art. Even if everything is just slightly off-model from what we know, which is easy to forgive as, at the time, the Fourth World stuff was only a few years old, not having the decades to burrow into fandom’s collective heads like it’s had now. It always seems jarring to me when a creative team takes over after Kirby left his creative stamp on a character/property/creation… And Newton/Adkins is NO minor art team, to be sure. Alas, this reminds me that, much time my “eternal” shame (wait for it), I have yet to read the entirety of Kirby’s ETERNALS (see?) Series. Then, with each subsequent revival attempt of that property, it just seems that they are pale imitators to his original vision. As for The NEW GODS, my exposure is limited to some Giffen LEGION OF SUPERHEROES stuff with the GREAT DARKSEID SAGA that I read a hundred years ago, and other things from that period. I was just ruminating on this the other day… As a young lad, I just didn’t QUITE grok Kirby. I liked it… But I didn’t fully appreciate it until years later when my comic art palette matured. He was just SO ahead of the curve whilst creating the curve at the same time. 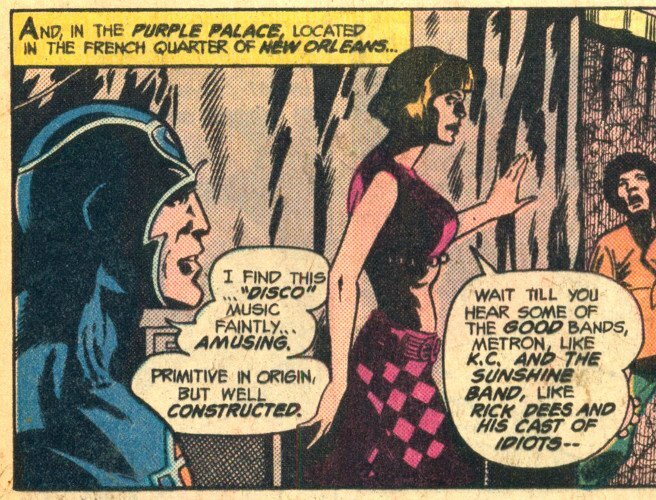 Sadly Metron was hoping to stumble upon some dixieland jazz, but apparently New Orleans was the wrong place for that. I just hate the thought of someone from New Orleans, of all places, recommending those bands. Sheesh, Allen Toussaint and Irma Thomas were right around the corner! Get it together, lady!